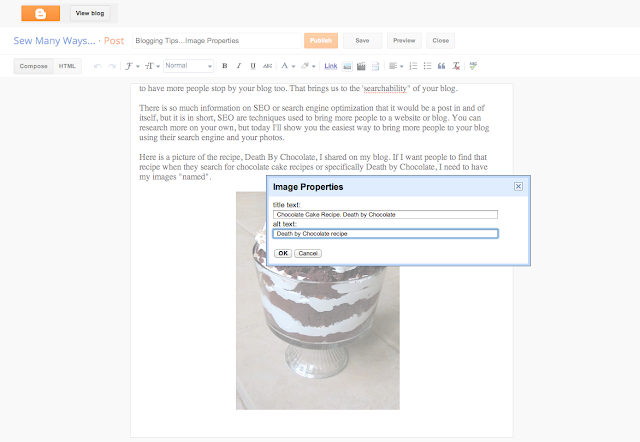 Today's blogging tip is about picture or image properties. Properties...referring to the name or phrase associated with the image to make it "searchable". We all work hard on our blogs. We create projects, sew quilts, cook yummy treats, share our homes etc and with all that...we take pictures of everything. 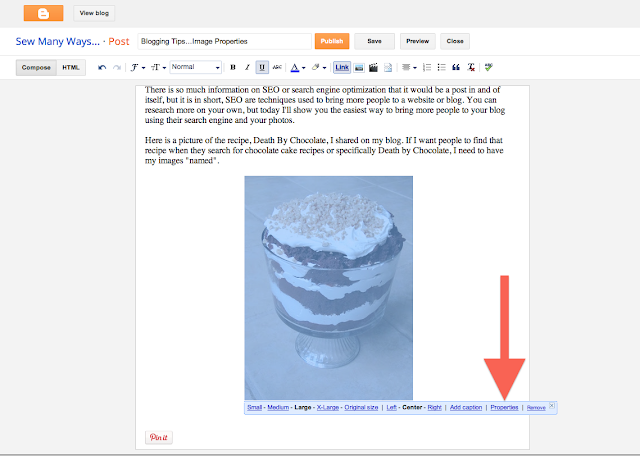 If you are a blogger, you love to share and you want others to stop by your blog to see what you've been up too. Other than your followers, you would love to have more people stop by your blog too. That brings us to the 'searchability" of your blog. There is so much information on SEO or search engine optimization that it would be a whole post in and of itself, but in short, SEO are techniques used to bring more people to a website or blog. You can research more on your own, but today I'll show you one of the ways to bring more people to your blog using their search engine and your photos. Here is a picture of the recipe, Death By Chocolate, I shared on my blog. 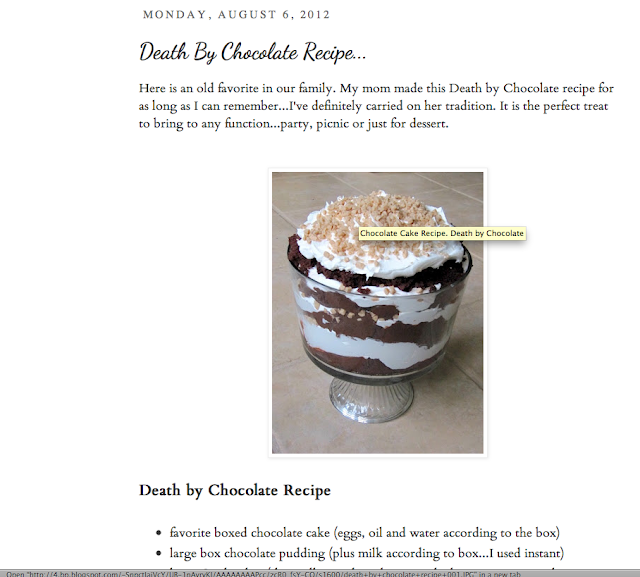 If I want people to find that recipe when they search for chocolate cake recipes or specifically Death by Chocolate, I need to have my images "named, labeled or tagged". Once you load your images onto your post editor, click on the picture until it turns blue. This is also how you change the size of the image and whether it's left, right or center in a post. Click on the "Properties" link shown with the red arrow. A pop up window will appear. You can write whatever you like in either line, but better to keep it short. The first line is "Title Text"...this short phrase is a description of the picture if someone hovered over the picture with their mouse. See example below this image. This is great if your post is picture heavy with not a lot of words. The second line is "Alt Text"...this description doesn't normally show, but will for people who have their browser or email settings set where images won't show. At least they'll see this description. I also read somewhere, it will help with visually impaired who have special features on their computer. They can't see the pictures very well, but the text will help. Here is a screen shot of the original post I did. I hovered over the image and it shows the "Title Text" in the yellow box. This is one more technique to use to help drive traffic to your blog. However, one of the most important things are key words (search words) you use in your title and in the body of the post itself. Google's and other search engines look for those key words when someone is searching something on their computer, but image properties will help too. An example would be someone searching for "chocolate cake recipes". I used those words in the body of my post and in the image properties. Will I go back and add this to older posts? Maybe some, but probably not. That will be on the bottom of my "To Do" list...which is very long!! excellent tip! I didnt even know about this, Thanks! Hi Karen, Thank you for the great tip!!! Easy to do, now I just have to remember to do it!!!! Happy Easter to you and your loved ones!!!! Thankyou. Never knew about that! Thank you Karen! I already did it on my blog, so I will waiting to see the results. Before this I´ve spedding so much time trying to find out how it works! Have a nice week! Thanks, I never thought about adding descriptors to my photos! So many things out there I never even heard of before. Just found out about Google Reader only because it's going away soon. Glad I didn't know about using GR or I would be sad. I will try to remember to add descriptions to my photos now too. Thanks Karen for another great tip! What a wonderful tip, thank you for sharing!! Thanks Karen!! Great post ---- I didn't even realize these things were possible. Excellent, excellent. Thank-you for this tip. I am soooo loving all of your blogging tips!! I have bookmarked all of them and as soon as I have TIME I will implement them! A BIG thank you for all of the tutorials you have taken time to post. 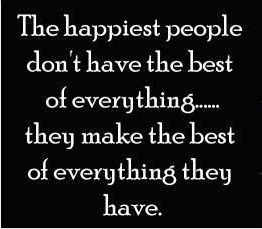 They are all wonderful. I am always learning something from you. Thanks for this tip. thanks sew much for the great tip! You always give such great tips =) Thank you. Another great tip! As many, i didn't even hear of such a thing! This will be very helpful, thanks a lot Karen! Thanks for the info...I will try it out! As they say "you live and learn" thanks for the tip. Will definitely have a go at this next time I post. Thank you, Karen! I've been trying to remember to do this. I guess, it's just a matter of getting in the habit of adding that info when you first upload a photo. I am thinking of going back and adding this info to the tutorial and recipe photos that I have on my blog, but not to every photo. Thanks for the input. I've recently started a blog page I don't have any followers yet :( but this helps me get some attention to my page!!!! I APPRECIATE it! As usual Karen you provide info I didn't even know I needed! Thanks so much for sharing all your knowledge it really makes a difference and is so much appreciated, you're the best! And another great tip I didn't know I could do with my images! As far as SEO goes though, the Alt Text is more important than the Title Text of images. Google and other search engines care more about that Alt Text when they crawl your site(s). So if nothing else, add the Alt Text. Key words are also good in Alt Text (but don't use too many or it's considered "keyword stuffing") and keep the Alt Text as short as possible for the best results. Thanks for that wonderful tip! Thank you for this tip! I had no idea that we can add a name to a photo. Thanks for such a clear explanation, now I have to remember to do it on my next post! Thanks Karen, echoing many of the previous comments I had no idea you could do this! Thanks for the tip. I'm just starting my own blog and I'm happy to find out any useful tips.